As winter's ice melts, waterfowl, particularly ducks, arrive at area lakes in large numbers along with migrant gulls. 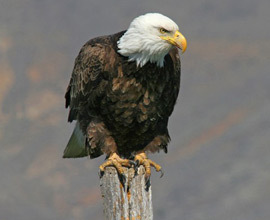 Bald eagle numbers peak and other raptors (hawks & falcons) begin moving north through the area. Our earliest shorebirds Wilson's snipe and killdeer arrive. The last two weeks of March bring our earliest resident flycatcher, the eastern phoebe, and the beautiful song of an early migrant sparrow, the fox sparrow.